1)Car won't start, sounds like there's no compression on any cylinder. Keep trying till it starts to sputter, but the plugs are fouled. Do nothing, walk away. 2)Try the next day. Car cranks like it has compression and starts easily. Runs rough a minute and smoothes out. Runs great for as much Saab enjoyment as I want for that day. 3)Go out the next day and no compression again. Leave it alone. 4)Try it the next day, she fires up and drives great. My first thought was that the fuel leaked down, washing the cylinders. I've removed the rail, observed, saw nothing. No fuel present in regulator vacuum hose either. That would explain poor compression, but I'm tellin ya it sounds like the "all valves bent" kind of no compression. Anyway, I tried my best to catch some fuel leakage in the act at various times and temperatures and nothing found. I'm pretty confident the problem is not fuel leakage. My next idea was that the timing chain tensioner ratchet failed leaving oil pressure as its only source of tension. Sounds like a good explanation. Say you shut it down, and the cam lobes want to relax in their happy place. 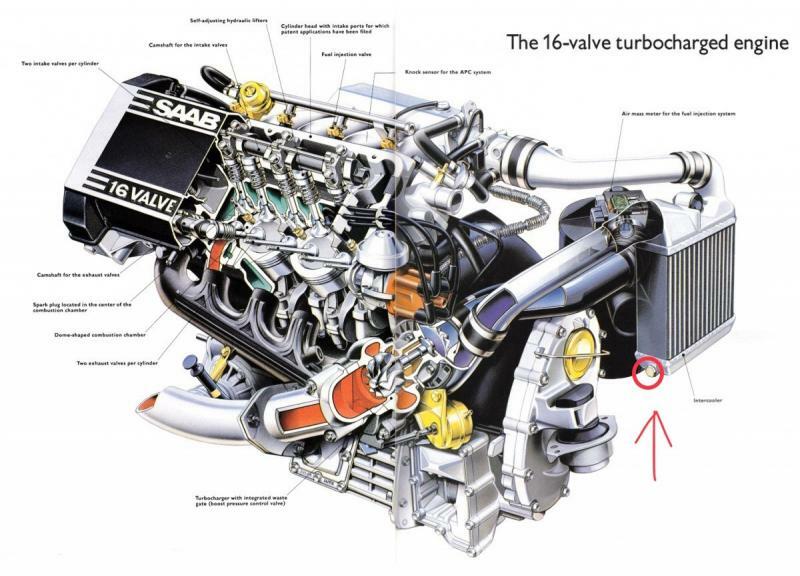 The valve spring pressure against the lobes may coerce them to rotate slightly, and in doing so, their desire to rest where they want might overcome the failed tensioner, pushing it back. Maybe even far enough that when I try to restart it, it acts like a severely worn chain that can't drive the cams in proper time. I don't think there'd ever be enough slack to actually jump a tooth in this situation though. When you install a chain, you can't quite put it on with just the slack afforded by a compressed tensioner, you have to have a sprocket unbolted, or a guide removed. Anyway I pulled off the valve cover and put the engine to tdc when the no compression condition was present. Everything lined up perfectly and the chain was tight all sections. I removed the tensioner and found no mechanical fault with it. I even installed a different tensioner and the problem is exactly as it was previously. How can an engine like this loose compression on all cylinders, and be fine later without doing anything to it? Are the lifters on these engines so soft they won't open a valve the least bit if they're drained? Would every one of them bleed out at the same time? Is there a check valve somewhere required to hold the oil up there? And if that were the case how could they hold pressure overnight when I walk away from the failure to start? The oil is definitely getting up in the head. everything was well oiled when I had the valve cover off. I can't imagine sticking valves or lifters because it runs so great once it gets going. There'd have to be at least 4 doing it by the way it sounds when cranking. Same goes for the theory of warped oval shaped valve seats. You'd think if 4 or more were bad, I'd never get them all to seat well enough to run great. I'd like to know if there's anything specific to look for before I tear into the head. This is 27 year old technology and all my thoughts go to everything but sticking valves on 4 cylinders at the same time. I'm thinking in the direction of the electronic choke and everything in the line that controls fuel air. This car predates OBD2 and without a scan tool tracking this down could be a real one part at a time, when it doesn't work at the time, by guess and by gosh project. When it doesn't start, start with the first thing in the line and un plug your airflow sensor. If that doesn't get the car started, start working your way back one piece at a time. When I owned a '91S that was reluctant to start, it was due to a bad head gasket, which is common to the 2.1 engine. Bad gasket from the factory, all 2.1s eventually need replacing. Check that. It's hard to imagine free-spinning turning to useful compression. Of course, try doing a compression test when the problem exists. If you have the time a video of the cranking might help diagnose too. I agree with digger it may be something blocking the intake intermittently like the electronic choke or something. When the problem exists you can try sucking air from one end or blowing air from the other to further diagnose as well. Also try cranking with the intake hose at the manifold disconnected so see if you can get it to do anything. I know virtually nothing about the 91 900S specifically but I know alot about Saabs in general so please don't take my word over anybody else's here but those are my thoughts. Good luck! Thanks for all the replies. I haven't gotten a chance to do much with it yet, but have been using the car every few days to help track the characteristics of it. Ambient temp has no effect. We've had a deep cold snap, and a warm spell with no change. I did leave it running for an extended period of time and the next day it cranked like it had compression on 2 cylinders and started and ran on 2 cylinders, but didn't smooth out, so I shut it off. The day after that it started normally, ran rough for a minute and was great thereafter. This was an improvement over the typical pattern, in the fact that usually it has no compression. The thing that was weird was that even once running it didn't seem to build up compression on the cylinders that lacked it. I could tell by cranking it up after shutting it off. When I get the chance to work on it again, I'm going to pull the valve cover, roll it to tdc and check leak down on each cylinder. I wonder if lifters can get pumped up with air and hold valves open when they aren't supposed to. It's just so weird that it follows a pattern and corrects itself, yet seems to be a mechanical issue. Engine is naturally aspirated, so no turbocharger or cooler. Aah yes NA is the critical detail I was missing there. Good luck! Interested to see what it could be! I wonder if lifters can get pumped up with air and hold valves open when they aren't supposed to. If your valves were open when they shouldn't be, that cylinder would not come back to life without major surgery. An interference engine doesn't have enough space up top for a valve to be open and a piston to be up at the same time. Did unplugging the airflow sensor make any difference?? Problem solved! The issue was caused by either varnish buildup on the valve stems or deposits around the valve seats. I put a bottle of STP in the tank, and 4 oz. of Sea Foam in the oil. Then, ran 12 oz of Sea Foam through a vacuum hose at 1500 rpms with a tee in it to draw air to atomize it. I had to modulate the flow by placing a rag over the tee to partially block the air to get it to draw from the can. 2 consecutive days later without a problem! Here's why I'm saying this is what it was even though I haven't inspected the valves. After tracking the symptom extensively, I was able to confirm for sure it was indeed an internal mechanical issue because the way it sounded while cranking. When an engine is cranking, and you can't detect any compressive pulses, you can tell there is no compression without testing it. Again, I have been amazed at how it can go from no compression to running great without major surgery. I would understand if it went from no compression to running poorly. I am still amazed at the nature of this case. But every time it was no compression on a cold start following a hot soak. When you go to start it cold and it fails, you've broke things loose without creating a hot soak, so next time it fires up. After inspection of the timing tensioner as described in previous post, I was left with only the possibility of valves sticking in their guides or deposits on the seats. I tried the Sea Foam just for kicks with the intention of cleaning varnish on the stem in the location where it rides in and out of the guide. If it turned out to be deposits on the seats, the Sea Foam would help with that too. And luckily it worked. Even if it stays good, I plan to treat it two more times to clean it best I can. I did notice sometimes while cranking there was a scary sounding snap noise which I've come to believe was a piston hitting a stuck valve, but since the cams were still in time there was nothing hard holding it open and it closed under the force of the piston rather than bending. If the problem does return, I'd expect to find the valve stems gawled up or pitted in the guides. But I'm hopeful that it was merely varnish buildup that can be cleaned. I'll update this thread if there are any future problems with this issue, but due to the consistency that it occurred, I'm confident it was improved by the induction cleaning. Just another one of those seafoam miracle stories! I was reluctant believing seafoam had any use for some problems simply because of all the doubt floating around on the Internet about snake oil and whatever else. But here it seems like definitive proof that seafoam does find its way into the trouble areas and get rid of the varnish/gunk! Glad you were able to resolve the issue without having to take the valves out! That would have been a bugger considering the easy fix you found.